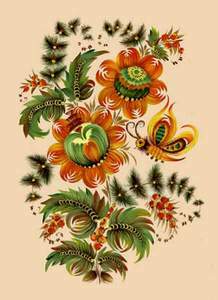 Nature has always been a common theme in art, especially folk art such as fabric painting and embroidery. In Russia and Ukraine, people believe that different design elements serve as symbols to protect them from evil forces, to bring wealth, health and love. The folk art, craft and clothing are decorated with endless ornaments and floral designs: stylized flowers, leaves, buds, stems and the like. 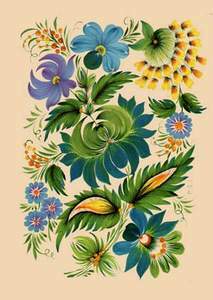 The myriad colors seen in Russian folk art were a representation of the blossoming of the earth, and the blossoming of the creative spirit. Russian folk art, as we know it, came into its own in the late 1800s – it decorated peasant homes, arches and spinning wheels, flowered in Zhostovo trays, Kursk rugs, Russian porcelain and was an integral part of the lifestyle of Russian cities and suburbs. 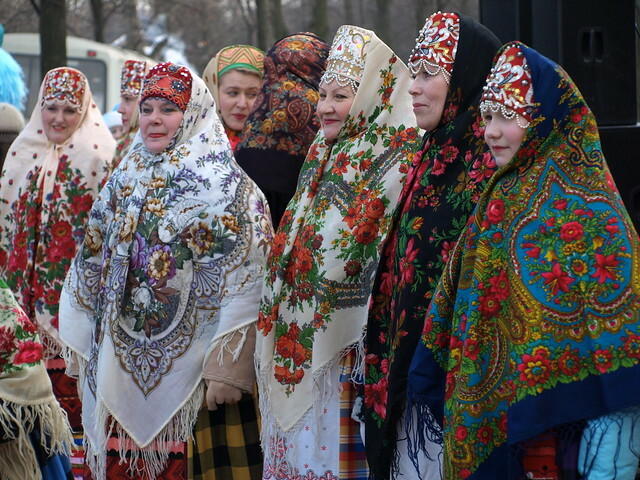 Colorful patterns became anessential part of the Russian national costume. 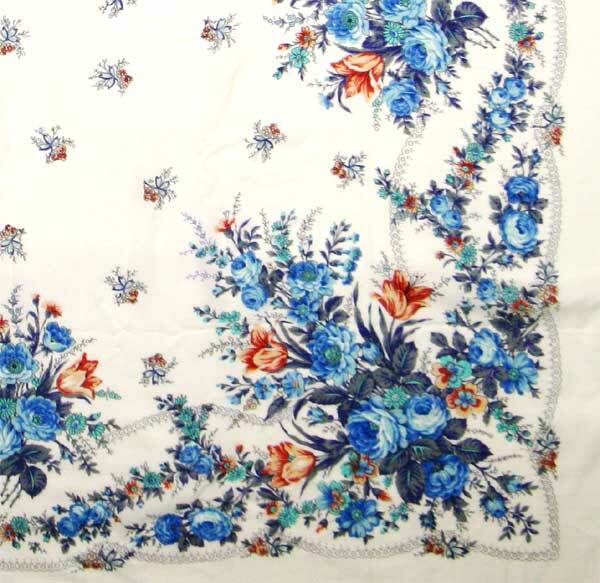 In the 18th and first half of the 19th centuries, headscarves and sarafan fabrics were distinguished by the breathtaking ornamentation sown on them in goldenthread. 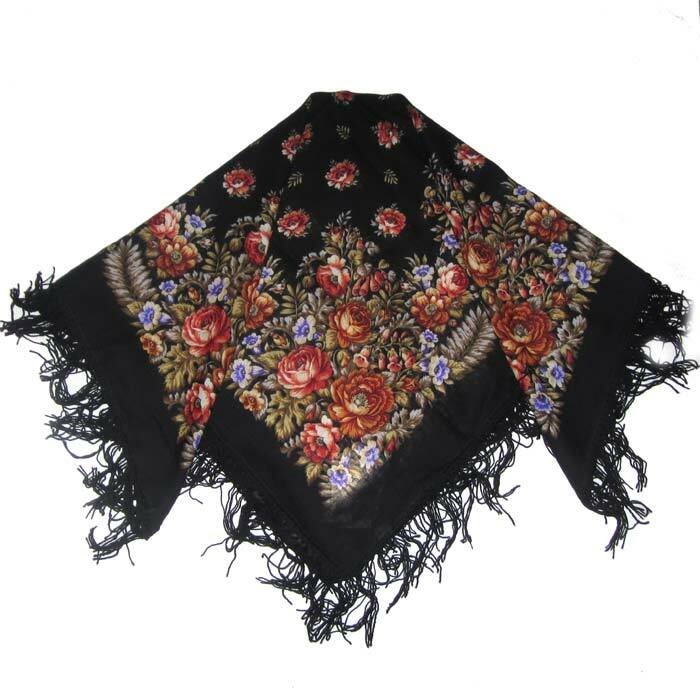 The decoration of Pavlovo-Posad (a district near Moscow), which decorated shawls and headscarves with colorful motifs, was developed mostly in the latter half of the 19th century.The magnificence of the color and composition of the Pavlovo-Posad headscarf owes to the virtuosity of the masters who cut the pressing boards used to print drawings on the fabric, as well as the masters who pressed the colors. Each color is printed using a different board; as many as several dozen boards can be used for a single item. Each center of folk art is characterized by its own color scheme and ornaments. An example of this is the Petrikovkiy style. Petrikovskiy originated long before the advent of Christianity, and served as a talisman (obereg). People believed that in beauty there is magic and spiritual strength, and therefore windows and doors, dishes and clothes, everything should be magically framed by ornament, in order to protect the people inside. This ancient tradition of hundreds of years of ornamentation is seen widely throughout Ukraine to this day. Ornamental motifs are dominated by bright, vivid colors. They seem simple at first glance, but if you look closely, you can see the long and painstaking work of the artist, delicately portraying the tiniest details of the picture. 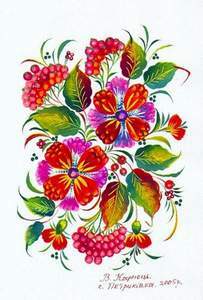 A modern Petrikovskiy pattern is characterized, above all, by plants: the main motifs are painted wild flowers, branches of viburnum, hollyhocks, peonies, asters. It is based on careful study of real local flora, combined with a colorful imagination (for example, patterns known as “lucka” or “kucheryavki”). The motifs often use garden and meadow flowers and berries such as strawberries and grapes. These are interspersed with images of foliage, ferns, buds and feathers. In the mid-20th century, birds appeared in the ornaments – both fantasy and real, such as peacocks, swans, and roosters. The bird is often placed in the center of the composition, surrounded by the flowers, leaves and berries to provide balance. The space above the birds heard was clear, or else the plants were smaller and lighter in color. When you wear Kurochka Clothing’s new Patterns shirt, its flowers will protect you from bad and bring you wealth, health and love. The village of Petrikovka founded 230 years ago by Petro Kalnyshevsky (the last Kosh Otaman of the Zaporozhian Host; a hero of the Russo-Turkish war of 1768-1774). from cat hair, sticks wrapped in cloth or simply their fingers. Paint was made with eggs and milk, with vivid colors inspired by the colorful nature of the Dnieper. The women competed with each other, trying to make theirs the most beautiful home in the village. The people believed that their houses were a reflection of what kind of person they were, how spiritually rich they were. On the other hand, the people whose walls were bare weren’t worth even saying hello to, because they were seen as morally dark and lacking. 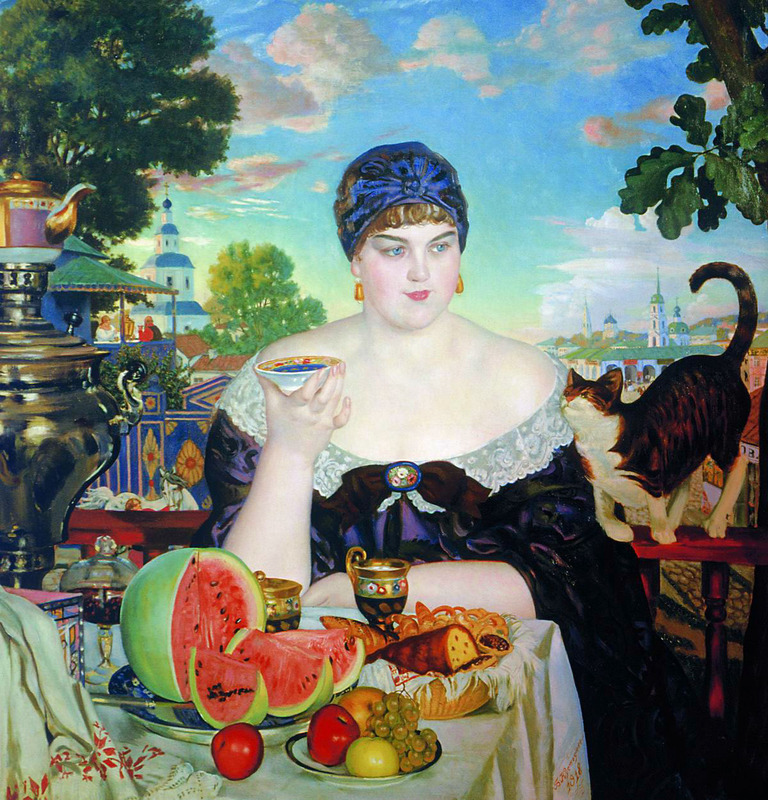 Then came World War I, the Revolution and Collectivization, and as a result, folk art was put aside in favor of art more fit for the philosophy of the Soviet Union. Since the 1930s, however, Petrikovskiy folk art has been reviving; there is an organization in the village, which now employs 45 folk artists to carry on the tradition. 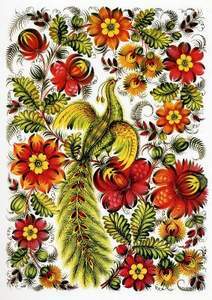 Stay tuned for more about Russian and Ukrainian decorative folk art: Gzhel, Palekh, Hohloma, Jostovo and more.